Measures 144″ by 48″ by 14″ 3/4 Cord Woodhaven Firewood Rack. Larger users keep this rack further from the house and use smaller rack closer to the house. Like all of our racks, it has a black, powder-coated finish, arc- welded end sections, Stainless steel nuts and bolts, our lifetime structural warranty, and includes the cover! Great Gift Idea INCLUDEs COVER: Our own unique design covers firewood the way it needs to be covered! They keep the top completely dry and ready to burn, and allow for air to flow through the firewood to reduce mold and mildew and promote curing! All of our covers fit around the 4 uprights of the rack and move down as the wood stack decreases. The cover is made out of top-quality re-enforced vinyl, and has velcro front sides for quick access to your firewood. Fits wood up to 24″ long. Measures 48″ by 48″ by 14″ 1/4 Cord This Woodhaven is the right size for everyone! Larger users, keep this smaller rack closer to the house to have a supply of firewood close by, leaving the rest of the wood neatly in one of our larger Woodhavens further from the house. Like all of our racks it has a black, powder-coated finish, arc-welded end sections, Stainless steel nuts and bolts, our lifetime structural warranty, and includes the cover! Great Gift Idea INCLUDES COVER: Our own unique design covers firewood the way it needs to be covered! They keep the top completely dry and ready to burn, and allows for air to flow through the firewood to reduce mold and mildew and promotes curing! All of our covers fit around the 4 uprights of the rack and move down as the wood stack decreases. The cover is made out of top-quality re-enforced vinyl, and has velcro front sides for quick access to your firewood. Fits wood up to 24″ long. Measures 60″ by 48″ by 14″ 1/4 Plus Cord Woodhaven Firewood Rack. Like all of our racks it has a black, powder-coated finish, Stainless Steel Nuts and Bolts, arc-welded end sections, our lifetime structural warranty, and includes the cover! Great Gift Idea INCLUDED COVER: Our own unique design covers firewood the way it needs to be covered! They keep the top completely dry and ready to burn, and allow for air to flow through the firewood to reduce mold and mildew and promote curing! All of our covers fit around the 4 uprights of the rack and move down as the wood stack gets smaller. The cover is made out of top-quality re-enforced vinyl and has Velcro front sides for quick access to your firewood. Fits wood up to 24″ long. The Brown 3ft firewood rack is used for both outdoor and indoor firewood storage. 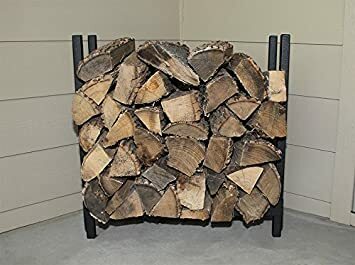 This firewood rack can hold up to 1/8 cord of firewood. 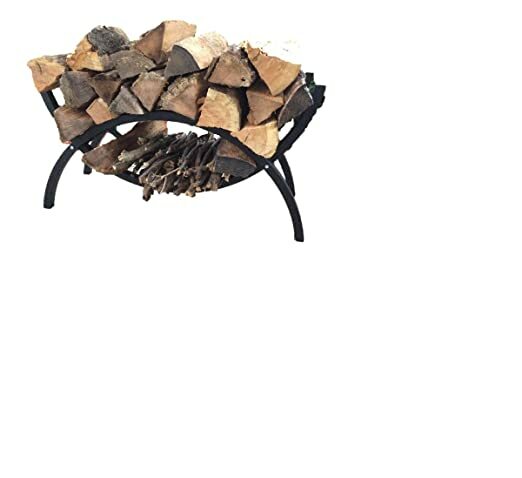 This firewood rack is ideal for indoor or outdoor fireplaces. It also makes a great housewarming gift. This firewwod rack is built by The Woodhaven in Kansas USA. 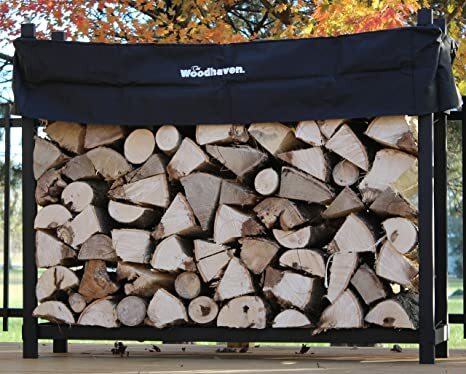 The Woodhaven Crescent firewood rack features 16 ga heavy-duty 1.25″ square tubing, baked-on powder coat finish, stainless-steel nuts and bolts. Features: Type: Firewood Rack. Color: Brown. Finish: Powder Coat. Stainless-steel nuts and bolts. 16 Ga heavy-duty 1.25″ square tubing. Specifications: Overall Dimensions: 39.75″ (L) x 15″ (W) x 22″ (H). Measures 120″ by 48″ by 14″. 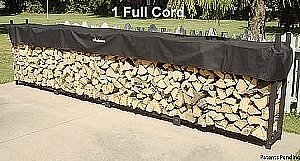 1/2 Cord PLUS Woodhaven Firewood Rack. Larger users keep this rack further from the house and use smaller rack closer to the house. Like all of our racks, it has a black, powder-coated finish, arc- welded end sections, our lifetime structural warranty, Stainless steel nuts and bolts and includes the cover! Great Gift Idea INCLUDEs COVER: Our own unique design covers firewood the way it needs to be covered! They keep the top completely dry and ready to burn, and allow for air to flow through the firewood to reduce mold and mildew and promote curing! All of our covers fit around the 4 uprights of the rack and move down as the wood stack decreases. The cover is made out of top-quality re-enforced vinyl, and has velcro front sides for quick access to your firewood. Fits wood up to 24″ long. Measures 96″ by 48″ by 14″ 1/2 Cord Woodhaven Firewood Rack. Larger users keep this rack further from the house and use smaller rack closer to the house. Like all of our racks, it has a black, powder-coated finish, arc- welded end sections, Stainless steel nuts and bolts, our lifetime structural warranty, and includes the cover! Great Gift Idea INCLUDEs COVER: Our own unique design covers firewood the way it needs to be covered! They keep the top completely dry and ready to burn, and allow for air to flow through the firewood to reduce mold and mildew and promote curing! All of our covers fit around the 4 uprights of the rack and move down as the wood stack decreases. The cover is made out of top-quality re-enforced vinyl, and has velcro front sides for quick access to your firewood. Fits wood up to 24″ long. 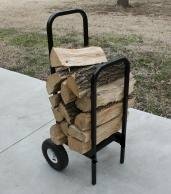 The Woodhaven Firewood Cart is the only cart on the market to feature a solid arch welded frame construction in order to allow minimal assembly while adding strength. The cart features two pneumatic wheels to maximize mobility. It has a strong UV resistant powder coated finish and can hold up to 300 pounds. Made in USA with a Lifetime Warranty. The largest production unit available! This huge unit features the same quality construction as all Woodhaven’s. It has a black, powder coated finish, Arc welded end sections, our Lifetime structural warranty, black plated stainless steel bolts, and includes the standard short cover! It does require 16 Feet of level stable space. INCLUDED COVER:Our own unique design covers firewood the way it needs to be covered! They keep the top completely dry and ready to burn, and allow for air to flow through the firewood to reduce mold and mildew and promote curing! All of our covers fit around the 4 uprights of the rack and move down as the wood stack gets smaller. The cover is made out of heavy duty quality material, and has velcro front sides for quick access to your firewood. Fits wood up to 24″ long. 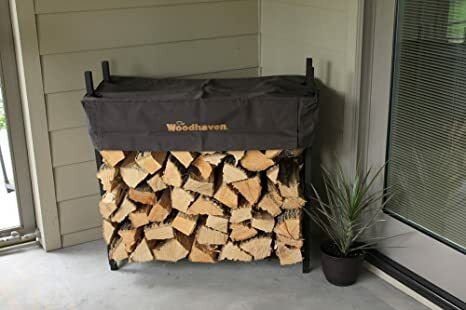 Measures 36″ by 36″ by 10″1/8 Cord Woodhaven Firewood RackThis Woodhaven is the right size for everyone! Larger users, keep this smaller rack closer to the house to have a supply of firewood close by leaving the rest of the wood neatly in one of our larger Woodhavens further from the house. This same size is perfect for people who only have fires for “special” occasions, you can buy firewood by the 1/8 cord and save a “bundle” compared with the prices at the convenient stores. Like all of our racks it has a black, powder coat finish, arc welded end sections, our 10-year structural warranty, and includes the cover! The Fireside firewood racks is the smallest unit in The Woodhaven line. It is designed to perfectly fit the need for keeping wood next to a fire pit, or fire place. The Fireside is an extremely portable rack weighing in at 15 pounds, which makes it perfect for camping. This firewwod rack is built by The Woodhaven in Kansas USA. 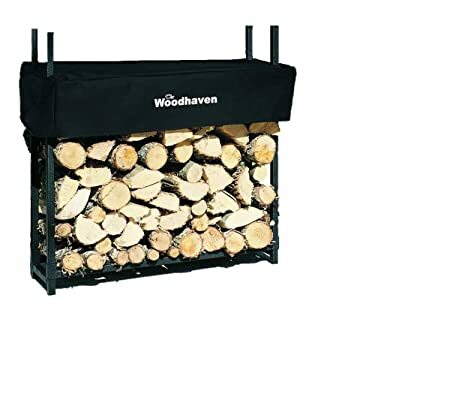 THE WOODHAVEN 5′ BLACK CRESCENT FIREWOOD RACK FEATURES HEAVY-DUTY SQUARE TUBING, STAINLESS-STEEL HARDWARE. BUILT FOR QUALITY AND BUILT TO LAST BY THE WOODHAVEN. 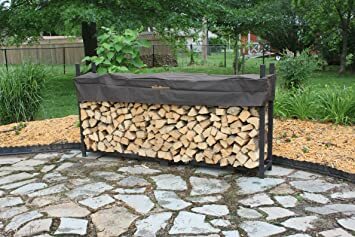 The Brown 8ft firewood rack is used for outdoor firewood storage. This firewood rack can hold up to 1/2 cord of firewood. This firewwod rack is built by The Woodhaven in Kansas USA.